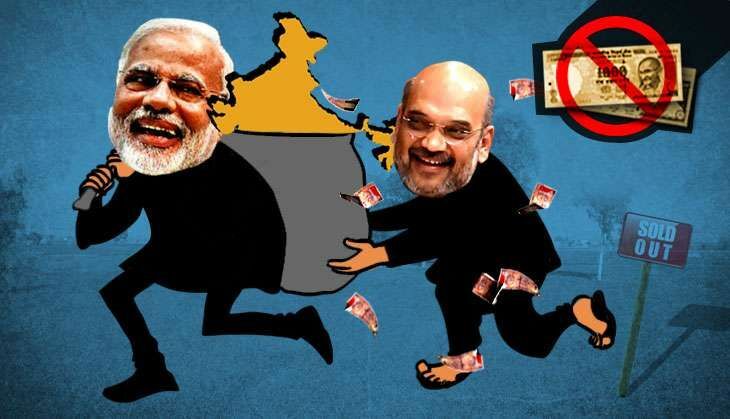 Days before Prime Minister Narendra Modi announced the demonetisation policy, his Bharatiya Janata Party (BJP) bought land worth crores of rupees. The party, in power at the Centre, bought several land parcels in Bihar up to the first week of November. And on 8 November Modi announced the ban on Rs 500 and Rs 1000. Catch accessed deeds of at least 10 such property transactions done by BJP functionaries in Bihar for the party. Some of them were even bought on behalf of BJP President Amit Shah. The BJP bought land in Katihar. Sanjeev Chaurasia, member of the Bihar Legislative Assembly from Digha, was among the senior party functionaries who bought the land parcels. According to him, such purchases were not limited to Bihar, but in other states as well. "Sab jagah khareeda jaa raha tha... Bihar ke saath aur jagah bhi khareeda jaa raha hai... Hum log to sirf signatory authority hi hain paisa to party ki taraf se aaya tha... saari zameein khareedi hain... party karyalay ke liye aur anya kaamo ke liye... November 1st week tak zameein khareedi hain." Based on Chaurasia's admission that land was bought by party representatives throughout Bihar as well as the country, and the deed documents, it is clear that BJP went on a property buying spree in a planned and phased manner. Land was acquired in cities and towns such as Madhubani, Katihar, Madhepura, Lakhisarai, Kishanganj and Arwal. The size of the plots acquired ranged from 250 sq feet to about half an acre. Their values range between Rs 8 lakh to Rs 1.16 crore. The costliest land parcel was bought at Rs 1,100 per sq feet. The BJP bought land in Saharsa in Bihar. READ NEXT >> Note ban: Why is PM Modi afraid of facing Parliament?